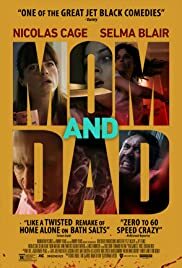 MOM & DAD is a black horror comedy in which parents go on a rampage turning violently killing their children. It is not the first time films have pitted parents against their children. The very clever PARENTS was one of them, way back when, when the son had to deal with his human flesh eating parents. Black comedy is the best way of dealing with this subject matter. MOM & DAD imagines a 24-hour nightmare where parents worldwide succumb to a mysterious mass hysteria that turns them violently against their own children. It is a macabre and inspired conceit, and works mainly because writer/director Brian Taylor (CRANK: HIGH VOLTAGE, CRAMER, GHOST RIDER) knows how to play the genre right and keeps his film funny and smart. Though one might think this one idea premise might run out of steam, Taylor has fresh ideas all through the film, that runs only at 83 minutes. Taylor use the tactic of flashbacks to inject humour to many a horror scene. Taylor has one where Cage and son sit down talking about his f**ked up life with a flashback on how Cage drove his dad’s car into an accident and had to work and pay him back for the damage. The same goes in the segment where Cage lets it all out in a flashback in the pool table man cave episode. Taylor pays tribute to the great suspense and horror directors like Hitchcock, Truffaut and Argento. The scene in which mom and dad spend ages trying to open the basement door is reminiscent of the segment in TORN CURTAIN, where Hitchcock shows how difficult it is to kill a man without a weapon. The sealing of the air of the basement door immediately reminds one too of Truffaut’s THE BRDE WORE BLACK when Jeanne Moreau sealed off the air from the staircase locker to suffocate Michel Lonsdale. The suspenseful scene with daughter, peeking through the keyhole where a knife is at the other end is right out of Argento’s OPERA. There are many other classic film nods that are fun to pick out. Taylor’s film contains a few ultra violent scenes (the dental hook), though they should be taken tongue-in-cheek. Like Hitchcock’s THE BIRDS, Taylor does not go into the explanation how the state of affairs parents wanting to do away with their children came about. It is immaterial. It could be guilt or nature’s revenge, none really knows. Like Hitchcock’s THE BIRDS, MOM & DAD has an appropriate abrupt ending. Nicholas Cage and Selma Blair are nothing short of perfect as the killer parents. Cage goes into his famous self-ranting rage, playing himself at his crazy best. He is plain hilarious while occasionally being scary at the ams time. Blair complements his performance. MOM & DAD appropriately premiered at the Toronto International Film Festival Midnight Madness Section in 2017 last year. It is the perfect film parents, frustrated at their disobedient kids need to see to get some steam off. It is also the perfect anti-family day movie.